TSTWREIS 5th,6th,7th,8th, 9th classes entrance test online application form 2019 for Telangana Tribal Welfare Residential Schools: TS Tribal Welfare Residential Educational Institutions Society(TSTWREIS) has published the TTWR Schools Entrance Test 2019 notification in April, 2019 for admission into 6th,7th, 8th, 9th classes in its TS Tribal Welfare Residential Schools for the academic year 2019-2019. This time TSTWREIS invites online application forms from Boys & Girls for admissions into and 6th, 7th, 8th, 9th classes in English for the Academic Year 2019-2020 in the TS TWREIS institutions functioning in Gurukulam. Before filling the application through online with the required details and supporting certificates, it is essential that candidates read the information carefully. 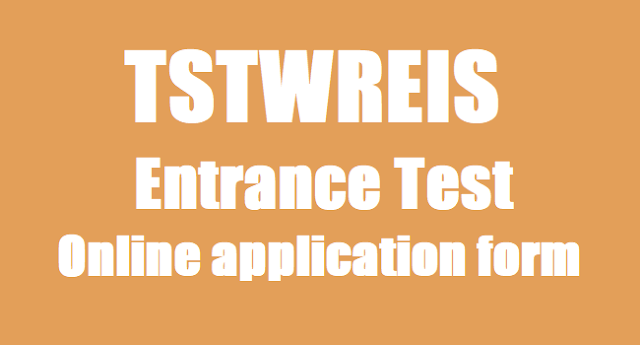 i) The candidates shall first download the ‘TSTWREIS gurukulam entrance test 2019 notification’ from the website http://tgtwgurukulam.telangana.gov.in or http://cet.cgg.gov.in/tstw/?login-theme-1 and go through it carefully and satisfy their eligibility for appearing for TSTWREIS CET 2019.
ii)The candidate after satisfying herself/himself about the eligibility criteria for TSTWREIS CET 2019. shall submission of application form through Online mode only. vi) Click on Application for School of Excellence Bhadrachalam at Khammam for filling Online Application Form. vii) Then Online Application Form will be opened for TSTWREIS SOECET 2019.
viii) Personal Details, Residential Address, Address of Educational Institution details and Admission Preferences should be filled up by the user.